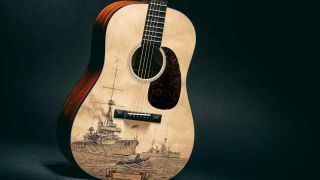 MUSIKMESSE 2015: Martin Guitars has announced that two new dreadnoughts will be on show at Musikmesse 2015, the massive instrument show taking place in Frankfurt later this month. First up, to celebrate the 50th anniversary of the original classic D-35, is the imaginatively dubbed D-35E 50th Anniversary Limited Edition. Featuring Martin Guitar's "Vintage Tone System", which claims to be able to replicate key tonal properties of actual vintage guitar tops, the D-35E features a European spruce top and East Indian rosewood sides and back wings with an organic East Indian rosewood wedge and maple bindings. There's are also a black ebony fingerboard and bridge combo, plus Fishman Aura VT electronics, which ultimately all adds up to a MSRP of $4,999. Next up, slightly oddly, is the LE-HMSD 2015, pitched as a commemoration of the day 100 years ago that the HMS Dreadnought, a British Royal Navy battleship, sank a German SM U-29 submarine. The original modern acoustic guitar developed by CF Martin and Co in 1916 was named after the Dreadnought's design, thanks to its wide, deep body. Leaving aside questions of taste and the wisdom of debuting the model in Frankfurt, the LE-HMSD is a striking guitar, thanks to the image of the eponymous battleship printed onto its Sitka spruce top. Once again, the Vintage Tone System is deployed, alongside a genuine mahogany back and sides, East Indian rosewood headplate and a black ebony fingerboard and bridge. Again, all yours for a MSRP of $4,999.